1. Glass: The printing press being invented led to more people becoming literate, which led to them being aware they're farsighted, which led to them getting glasses, which led to an industry of spectacle makers, which later led to microscopes and and then telescopes. 2. Cold: The rise of air conditioning led to huge population growth in the southern states of the U.S. and inventions and innovations often come in clusters, with multiple people independently coming up with the same thing. 3. Sound: The telephone played a role in skyscrapers, otherwise think of how difficult it would be to get messages to everyone. 4. Clean: Similar to how telephones enabled large buildings, plumbing and sanitation / waste removal enabled the growth of large cities. Additionally, understanding of germ theory and the need for clean drinking water has kept alive so many more people than would otherwise be the case. 5. Time: Time used to be a much more local thing with clocks synced to the location of the sun, but as things like telegraphs and railroads become commonplace, it made it more important to have standard time in different places. 6. Light: Artificial light changed people's sleep patterns. Previously they would go to sleep when it got dark, wake four hours later and stay up for a bit, then sleep for four more hours. 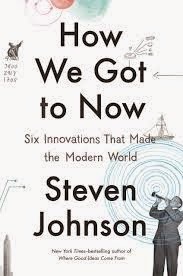 Overall, it was a solid, if at times a bit dry at times, book from Johnson and there was a simultaneous PBS/BBC television series he hosted that had the same name as the book.